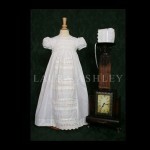 An simple yet elegant 32” long christening gown with short puff sleeves, which are gathered with ruffled lace trimmed cuffs. 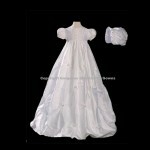 This gown is made of comfortable cotton fabric. The bodice is smocked and has a round neck. The bottom of the skirt has horizontal pleating and embroidered lace trim. Includes a built-in cotton liner/slip. 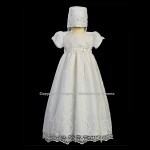 Matching bonnet with applique embroidered lace trim and ruffled edge. 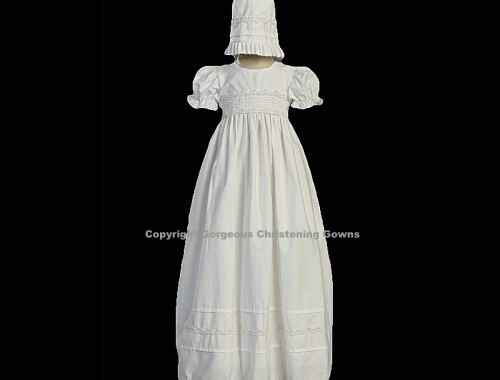 This christening gown is fabricated from cotton.